After the aratis to Sri Sada Siva and Sri Giriraj, devotees come to the main temples and sing first the Bhoga Arati, remembering the Lord's Pastimes. 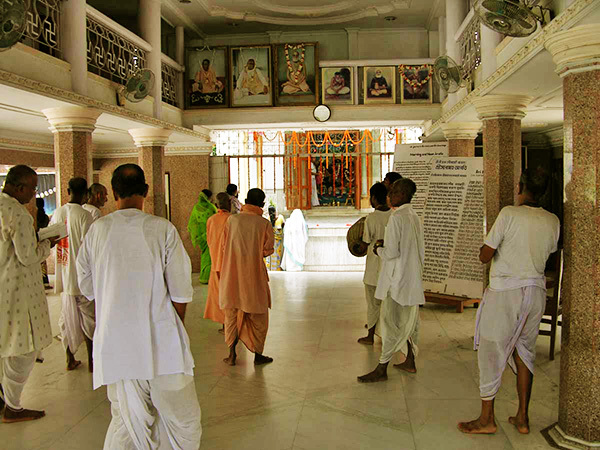 This Bhog Arati is sung at all main temples in Sri Nabadwip (Sri Sada Siva, Sri Giriraj, Sri Gupta Govardhan) prior to the main arati songs, while the temple servitor (pujari) offers the meal (bhog) to the Lord. Serve Sri Gaurahari, who is most affectionate to His devotees. He is the rambler in the fields (of Vraja), the stealer of Nanda and Yasoda's hearts. "It's time! Damodar! Come now! Sit down in the dining hall and eat." At Nanda's request, Krishna, Baladev, and Their friends sit down in lines. Sweet puris, puris filled with cream, sweet balls, dal patties boiled with sugared rice—Krishna eagerly eats all these preparations. With great joy Krishna eats various vegetable preparations cooked by Radhika. Glancing at Radhika and Her friends out of the corners of His eyes, Krishna happily eats in Yasoda's home. After eating, Krishna drinks scented water. Then all of the boys line up and wash their mouths. After washing their hands and mouths, Krishna's friends happily take rest with Baladev. Jambula and Rasala bring spiced pan. Krishna chews it and then happily goes to sleep. Visalaksa fans Krishna with a peacock fan, and Krishna happily sleeps on a comfortable bed. 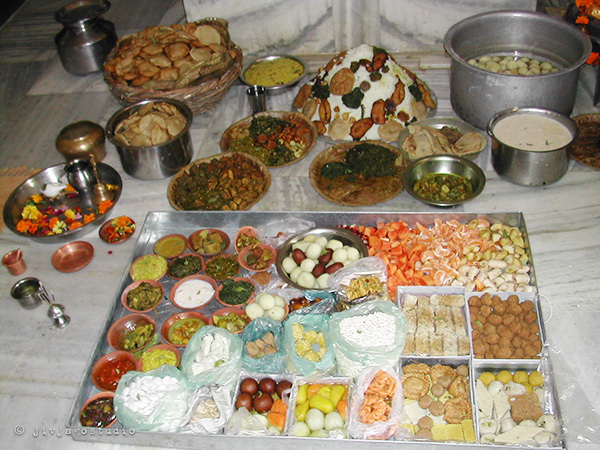 Being requested by Yasoda, Dhanistha brings Sri Krishna's remnants to Radha, who eats them joyfully. Lalita Devi and her friends then receive Radha's remnants and joyfully sing the glories of Radha-Krishna within their hearts. Thakur Bhakti Vinod, whose sole joy is the Lord's Pastimes, sings this bhog arati. Serve Sri Gaurahari, who is most affectionate to His devotees. Serve Giridhari, Gopinath, Nanda Dulal. All glory to Nanda's son! All glory to Sachi's son! All glory to Sachi's son! All glory to golden Gopal!